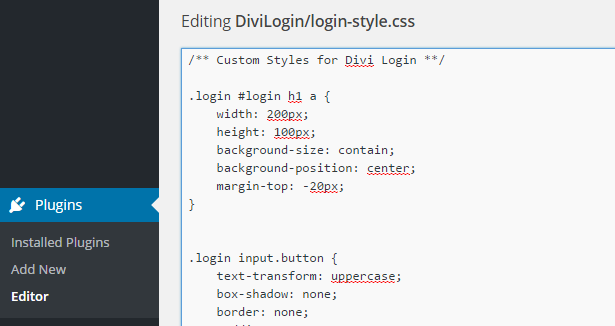 Remember: In order for the Divi Login Plugin to work, you must have Divi Elegant Themes. If you do not have it you can purchase it here. Once you have it, please install it on your self-hosted WordPress website. A light-weight 'Custom Login' plugin for the Divi Theme. Replaces the standard WP logo with the site logo uploaded in Divi Theme Options. Creates an editable style sheet for the wp-login.php / wp-admin page. Divi Login removes the WordPress logo from the wp-admin page and replaces it with whichever logo you have chosen in the Divi Theme Options menu. If you change logos, then the change is automatically reflected on the login page. The link which would have taken you to WordPress.org now takes you to your homepage. We’ve also avoided inline styles and have added a ‘login styles’ CSS style sheet so you can make as many visual changes to the current login menu as you wish. Packaged as a plugin, this could be de-constructed and added to child themes with minimum effort.